​Welcome to the website of the Frédéric Joliot Institute for Life Sciences, one of the eleven institutes of the Fundamental Research Division (DRF). The Frédéric Joliot Institute for Life Sciences, set up on 1st February 2017, is directed by Jacques Bittoun, assisted by the Deputy Director Annie Rivoallan, the Science Officer Maïté Paternostre and the Administrative Assistant Eliane Deck-Chaumont. This research is fundamental, technological, methodological or applied, which gives the institute a very complete positioning, from research to industry, to respond to societal issues related to health, energy and bio-defense. The Institut expertise covers a broad spectrum of skills, ranging from biology to mathematics and computing to medicine, physics and chemistry. This multidisciplinarity enables us to study living things in all their complexity, from molecular instruments to the whole organism. For that reason, Research Teams of the Institute have high-profile platforms and infrastructures at their disposal, certified IBiSA or integred in Infrastructures Nationales en Biologie et Santé (INBS) fund by the Programme Investissements d'Avenir (PIA) : France Life Imaging (Biomedical Imagery), FRISBI (Integrative Structural Biology), MétaboHUB (Metabolomics) et NeurATRIS (Translational Neuroscience Research). It counts 740 employees half of whom is part of Mixed Research Unities (UMR), in partnership with CNRS, INRA, Inserm, Paris-Sud et Paris-Descartes universities.  Its Research Teams are located mainly in Saclay and Orsay but also in Marcoule, Caen et Bordeaux. The Institute for Integrative Biologie of the Cell (I2BC) UMR 9198 (CEA, CNRS, Paris-Sud University) set up on 1st january 2015. Two service of the Frédéric Joliot Institute are part of the I2BC and form the I2BC@Saclay Department; these two service are required to join the CNRS campus of Gif-sur-Yvette in 2019. Click here to download the whole chart of the management of the Frédéric Joliot Institute ici.